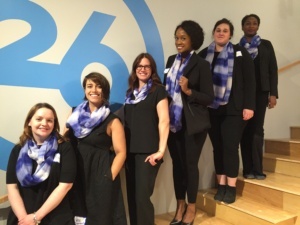 WIL PAC: Rebecca Watters, Sara Innamorato, Elaine Evosevic, Olivia Benson, Rachel Martone, Olusore Shields. There is a dearth of female politicians in SWPA. In 2016, nationally and in southwest Pennsylvania, women often face more scrutiny when running for office. When they are elected or appointed, male colleagues have been known to ignore their ideas or speak over them in public meetings. Additionally, women who speak up or fight for the policies that matter to them, may be characterized as angry, rude, and uncooperative. In fact, right now women represent less that 30% of all elected county offices in Allegheny County, there are NO women representing Allegheny County in the Pennsylvania state legislature, and finally, there are NO women representing Pennsylvania in Congress. This is unacceptable. It seems like a no-win situation – and in some cases, it is. However, the Women in Leadership – Political Action Coalition believes that this obstacle is a space where we can make positive change and get more women elected to office. Across the nation and prominently in Pennsylvania, groups are being formed to address the lack of women and minorities who run for office and who are elected. In PA, groups like EmergePA, RepresentPA, and the Chatham University Center for Women In Politics, raise money or educate women about why their voices matter, how they can make a difference by being using their collective capital to influence change, and what are the best ways to get involved and run for office. Oftentimes, these groups depend on women who are already somewhat involved in politics, to take the next step by donating to female candidates or by deciding to run. They don’t necessarily focus of extensive outreach efforts, promote opportunities for civic engagement, or address the general lack of apathy that may exist. That is where we believe we can make a difference. The Women in Leadership – Political Action Coalition will address the lack of women, especially women in minority groups and LGBT, in southwest Pa’s political landscape by working with existing women’s organizations and political action committees to help recruit potential candidates, creating an email list (15,000) to alert women to political gatherings and opportunities to network, educate women and public in general about the need for women in office, and raise $10,000 by January of 2017 to support, organize, and promote how electing women in important to our region’s growth.